12 employees decide to find a solution to their travel woes. Their office is in an out-of-civilization location at Hyderabad. 12 people of diverse cultures and team decide to hire a 12seater Winger which will pick & drop each of them at their decided meeting points on a the best, shortest route. From teething problems of punctuality, demands from home pickups and drops, ..they manage to make this venture a success. In the process they bond, make friendships lasting lifetimes, help each other, advice, have super fun times, fall in love, treats and parties, leg pulling,... The long journey is a pleasant and destressing one for each of them. Each of the passengers has a different trait and talent including the driver. Then some of them take objection to certain things, issues crop up in the harmonious group, some dictate, some resist,... the Cab service halts and so do the bonds each of them share. How will they Cab it again? Can egos and petty issues, break such good friendships? I liked the simple ways human psychology is embedded in this story. The way the basic essence of 'If our basic needs are met, we can perform better in our tasks' is added. 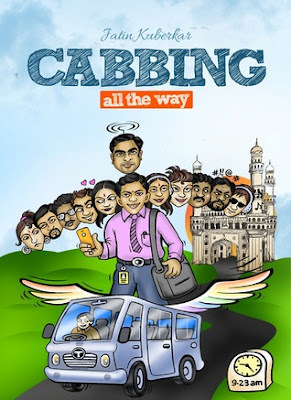 How the Cab is solving their commute issues, letting them concentrate on performing better at work and enjoy a lil more time with family. How if we each try we can help each other better ourselves and our life :) The way they helped Mohan get over his language problem, helped Pasha bhai with his festival celebrations, Chandu got his efforts appreciated, Jatin and others bettered their appraisals. The language is good. The flow is consistent. The narrative is like school comprehension assignments, detailed and long. Editing, in terms of reducing long portions. Some parts felt too stretched. It is an overall good book to read and enjoy. Read the book and let us know your take about it. Concise review Nilima. As I said before, you are getting better with each one. Kudos! :) Thank you Sundari !